In this chapter key workflow elements that are crucial for a successful cardiac CT examination were described. Ignoring any of them can easily result in a suboptimal or even non-diagnostic exam. Since the described workflow is quite complex, a dedicated cardiac CT training of the technologists is highly desirable. Keeping in mind that cardiac CT technology is quickly evolving, such training should occur on a regular basis. Clinical practices with well-trained dedicated cardiac CT technologists perform exceptionally well. For example, a recent publication from one of such practices reports only one non-diagnostic CCTA in 1022 consecutive examinations (Ghoshhajra et al., Eur Radiol. 27:2784–2793, 2017). This example clearly proves that cardiac CT can (and should) be successfully performed when all the key workflow instructions are followed. 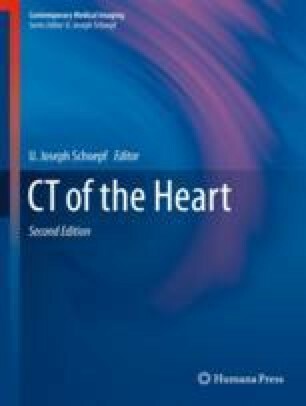 This chapter at hand only focused on two major aspects of the cardiac CT workflow: patient preparation and selection of the most appropriate acquisition mode. Other important aspects such as use of beta-blockers, contrast injection, dealing with difficult-to-image patients (e.g., morbidly obese or with poor renal function), and cardiac CT post-processing were deliberately omitted here because they are described in other chapters of this book. Siemens data sheet: Flex: http://www.neocoil.com/docs/16CH_Flex_Siemens_MRI/NC00S007%20Rev%20A%2016ch%20Siemens%20Flex%20Data%20Sheet.pdf. Romans LE. Computed tomography for technologists: exam review. Lippincott Williams & Wilkins. 2010. https://www.amazon.com/Computed-Tomography-Technologists-Lippincott-Williams/dp/0781777968.